“The Hand that Rocks the Cradle Rears the Patriot” was the subtheme of the 1896 Woman’s Congress theme of “Woman and Government”. The Pacific Coast Woman’s Press Association created the West Coast Woman’s Congress Association that sponsored four women’s congresses from 1894 through 1897. Each year, in late April or early May, congresses convened in San Francisco; the speakers and their subjects determined a specific theme. Accomplished women from the West Coast spoke for days, from morning till night. The Congresses were a smash hit, with women jamming every inch of space to get in and hear. 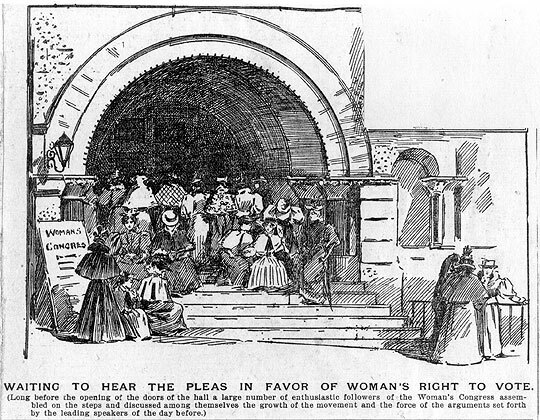 The 1896 theme aroused California women to go for the vote that November.